(PhysOrg.com) -- Ram pressure is the drag force that results when something moves through a fluid -- much like the wind you feel in your face when bicycling, even on a still day -- and occurs in this context as galaxies orbiting about the centre of the cluster move through the intra-cluster medium, which then sweeps out gas from within the galaxies. The spiral galaxy NGC 4522 is located some 60 million light-years away from Earth and it is a spectacular example of a spiral galaxy currently being stripped of its gas content. The galaxy is part of the Virgo galaxy cluster and its rapid motion within the cluster results in strong winds across the galaxy as the gas within is left behind. Scientists estimate that the galaxy is moving at more than 10 million kilometres per hour. A number of newly formed star clusters that developed in the stripped gas can be seen in the Hubble image. Even though this is a still image, Hubble's view of NGC 4522 practically swirls off the page with apparent movement. It highlights the dramatic state of the galaxy, with an especially vivid view of the ghostly gas being forced out of it. Bright blue pockets of new star formation can be seen to the right and left of centre. The image is sufficiently deep to show distant background galaxies. The image of NGC 4402 also highlights some telltale signs of ram pressure stripping such as the curved, or convex, appearance of the disc of gas and dust, a result of the forces exerted by the heated gas. Light being emitted by the disc backlights the swirling dust that is being swept out by the gas. Studying ram pressure stripping helps astronomers better understand the mechanisms that drive the evolution of galaxies, and how the rate of star formation is suppressed in very dense regions of the Universe like clusters. 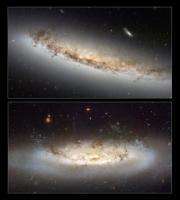 Both images were taken by the Advanced Camera for Surveys on Hubble before it suffered from a power failure in 2007. Astronauts on Servicing Mission 4 in May 2009 were able to restore ACS during their 13-day mission. It's a shame people keep entertaining the idea of destroying Hubble. If anything I think we shoudl keep that one up there and try to get another even more powerful space telescope. This storey is proof that Hubble is still a key asset in space exploration. It's a shame people keep entertaining the idea of destroying Hubble. If anything I think we should keep that one up there and try to get another even more powerful space telescope. This story is proof that Hubble is still a key asset in space exploration. Hubble may be too good at space exploration! 1. Stars are balls of Hydrogen. 2. Stars consume Hydrogen as fuel. 3. Stellar engines do not create Hydrogen as smoke. 4. The entire cosmos is powered by nuclear fusion rather than by nuclear dissociation. Fifty years of space-age measurements have falsified every statement above (1-4)! The main reason for destroying/retiring Hubble is that Hubble orbits earth and was designed to be maintenanced. However we are fundamentally changing our space program. Our Shuttles are being retired for a more rocket type design that has the added advantage of getting us back to the moon. The replacement is the James Webb telescope. Its ALOT BIGGER. Hubble uses visible light and ultraviolet ( a bigger wavelength) to take pictures JW will use mostly infrared, which will allow it to see, hopefully, through dust clouds a lot better. such as the galatic center, through nebula, through star clusters. the above link compares the two telescopes. Hubble was awesome but I look forward to the future. -- and i thought stars were still powered by hydrogen in the main sequence, then as they age by heavier elements??? could you link to a proof of that statement omatumr. the idea that we have to bring it down because we have to is is a contradiction because there's so many other space debris up in orbit; maybe we should bring all that space debris down before bringing the Hubble down!? Isn't it odd how long it takes for the Hubble managers to release these pictures? Hubble has been worth every single penny and IMHO is perhaps the best use and return on investment ever for US tax payer dollars. If only all tax dollars spent would seem to give 50% of the benefit of the Hubble program I would feel like we would be getting somewhere. by neutron-decay] "the ghostly gas being forced out of" NGC 4522 ! The scientists in charge thought that the Sun and other stars and galaxies are powered by Hydrogen-fusion, . . . . certainly not by the nuclear reactions that generate and fill interstellar space with Hydrogen! I am grateful that the pictures were finally released. Ram pressure stripping of NGC 4522 and NGC 4402 has been known and studied at many wavelengths over the past decade. A 2008 paper summarizing current research on ram pressure stripping of NGC 4522 can be found here: http://arxiv.org/...78v1.pdf . And a 2008 multiwavelength study of ram pressure stripping of NGC 4402 can be found here: http://arxiv.org/...78v1.pdf . Both papers outline the spectacular phenomena found in both these galaxies making their way through the Inter-Cluster Medium in the Virgo Cluster. The Hubble closeups allow astronomers to see this interaction in great detail. @Oliver K Manuel: Both papers I provided links to above clearly demonstrate neutral hydrogen (HI) being stripped from and forming long tails behind the parent galaxies as they pass through the ICM of the Virgo Cluster. Hubble imagery is in the visible and NIR regions of the electromagnetic spectrum. Neutral hydrogen tails have been detected at radio wavelengths in these (and other) Virgo Cluster galaxies for over a decade( see my second link ). This neutral hydrogen is primordial in nature and eventually contributes to extragalactic star formation in the galaxy cluster. The idea that all the stars in either of these galaxies are neutron-cored SNR belies the multiwavelength studies performed on these and other Virgo Cluster members. Tidal infall and stripping of galaxies (or groups of galaxies) in dense clusters is a well known and studied phenomenon. These Hubble images provide us with the clearest view yet of the visible light manifestation of galaxies undergoing tidal stripping.